Google has officially begun sending out email notices to site owners confirming their change from desktop indexing to mobile first indexing. And we do have some clarification on mobile friendliness being a criteria or not for sites changing over. Some people had speculated that a way to prevent mobile first indexing was to have a site that is not mobile friendly, but that is clearly not the case. The criteria seems to be matching content between the desktop version and the mobile version of the site alone, regardless of whether or not the site is mobile friendly. Some SEOs and site owners are against the whole concept of mobile first indexing for a variety of reasons, such as the possible loss of links or even just the work required to ensure the content on the desktop matches the mobile version. And some larger sites with long form content also face the challenge of making that more user friendly for mobile users, when they would normally serve a truncated version of the page to those mobile users. So some had speculated that keeping their sites from being mobile friendly would prevent the change to mobile first indexing. But whether or not a site is mobile friendly does not seem to play a role in Google swapping sites to mobile first indexing. Sites that are not mobile friendly, and that might not even be usable on a mobile device are also officially being swapped over to mobile first indexing. So mobile friendliness (or lack thereof) is definitely not one of the criteria Google is using for the swap. I received an email for an old legacy site that is definitely not mobile friendly. But it is true that the “mobile and desktop versions of your site are comparable.” It was sent to an old legacy site that has not ever been updated for use on a mobile device and would be extraordinarily hard to read on any mobile device. So Google’s internal criteria for what makes a site mobile friendly might not be completely up-to-par. From a Google perspective, though, it does make sense. 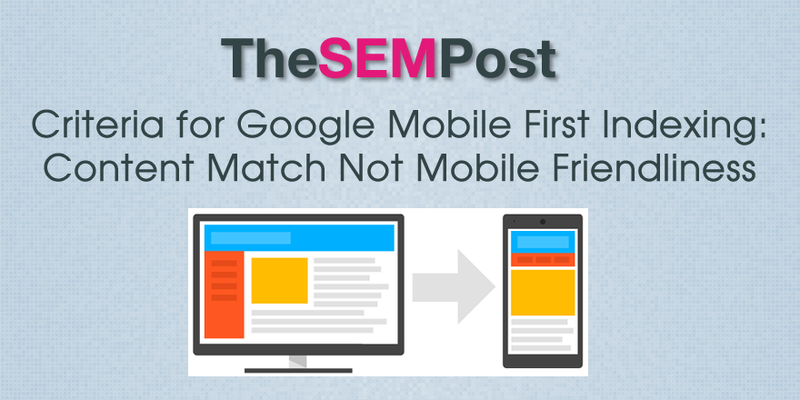 Google is wanting to ensure that a site has matching content on mobile and desktop before swapping it over, and sites that do not have a mobile friendly version definitely meet that criteria. Despite the fact the site is not mobile friendly (and is in fact horrible to use on mobile), the content does match and in Googlebot’s eyes, the content being indexed is identical. A non-mobile friendly site does not receive a mobile friendly ranking boost in the Google search results, regardless of which Googlebot is doing the indexing on the site. So a non-mobile-friendly site won’t benefit just because the mobile Googlebot is doing the indexing. The fact remains that the content is still the same across both regular (desktop) Googlebot and the smartphone Googlebot. So if you are trying to prevent your site from being changed to mobile first indexing, you can safely make that site mobile friendly. Content matching seems to be what Google is looking for at this time. However, Google will eventually be swapping all sites over to mobile first indexing, so in the future, even content matching won’t be a criteria at some point.